The fact that I'm based in Italy doesn't really help out with the management of MacStories advertisement. Being part of the BuySellAds network means that I have to deal with USD payments, which I have to convert everytime in Euros to see how much my income actually is. Which better tool than the iPhone to get a quick overview of currency conversion? There are hundreds of currency apps out there, including the popular Convertbot from Tapbots and Convert. Today I'll take a look at a new application that showed up this morning in my inbox, iCurrency Pad. The first thing you'll notice about iCurrency Pad (and trust me, it's impossible to not notice it) it's the user interface design. It's that kind of design I love and admire, refined to the smallest detail and well thought across all its components. This amazing design is by Angela from ToffeeNut Design, you can head over her website here or follow Angela on Twitter. Anyway, just take a look at the screenshots yourself to see how great looking the application is. Moving on, let me talk about what iCurrency Pad actually does, and that's lot. iCurrency Pad is a currency converter and calculator that also offers features like real time world exchange rates, charts with historical and current trends and multiple data sources. As you fire up the app, you'll be presented with the calculator screen, which allows you calculate the conversion between two pre-selected currencies which are USD and Euros to me. 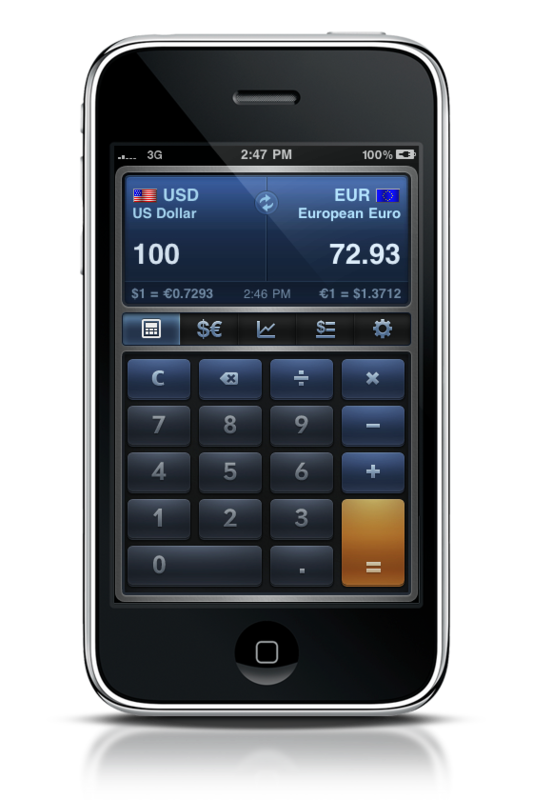 The interface is divided in 5 tabs, but instead of sitting (as usual in iPhone OS) in the bottom toolbar, they are placed in the middle of the screen (right above the calculator) instead. I was skeptical at first sight, but I have to admit the system works and it's pleasing to the eyes. Good job there, nice idea you had guys. 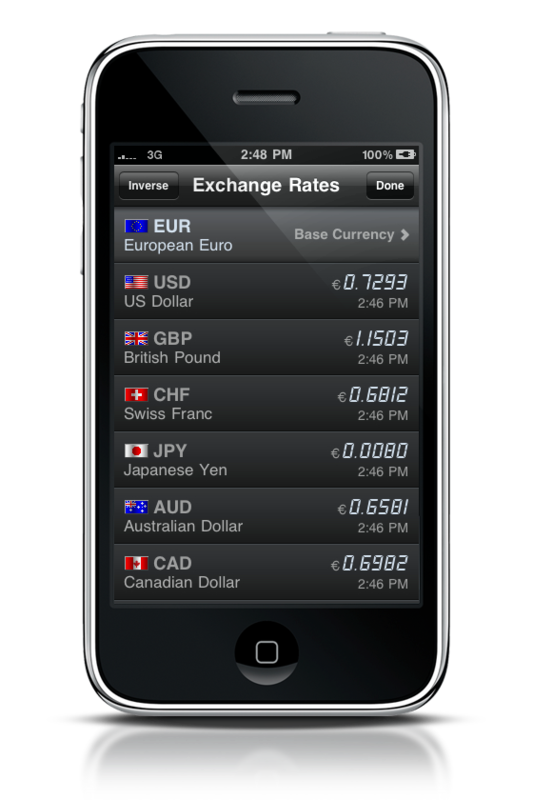 Back to the conversion, you can quickly invert the currencies by swiping your finger left or right over the currencies screen or hitting the refresh button. Also, the app will connect to the internet every few minutes or so to get the latest rates: the last update time is shown at the bottom center, while the conversion rate is located right under each currency. Very polished and well designed. And that's for the first screen. 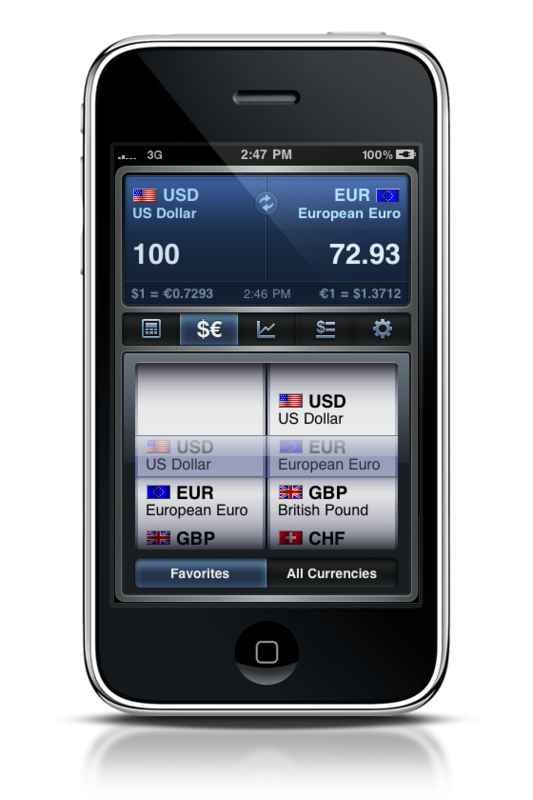 The second tab lets you pick up different currencies, either choosing from your favorites ones or "all currencies". You can select your favorites in the last tab - the Settings - where you can also set a different auto update time, enable the "shake to update" feature and change the data source from Yahoo (supports 150 currencies) and Ino.com (supports 60 currencies). Then we have Charts, and I'm sure that all of you financial geeks out there are gonna love this. iCurrency Pad offers detailed charts for specific time frames like 1s, 5d, 3m, 6m, 1y, 2y and 5y thus enabling you to retrieve complete historical graphs about rates changes. Also, you can hold two fingers to compare two dates within the same graph (ex: choose USD and 5 years, compare 2005 to 2008. See the recession?). On other hand, if you just want to have a quick overview of worldwide exchange rates, choose the fourth tab and you'll be all set with a list similar to those "Change" shops around the world. iCurrency Pad is a great piece of software powered by a stunning design and usability. It's beautiful, useful, powerful yet simple and straightforward. 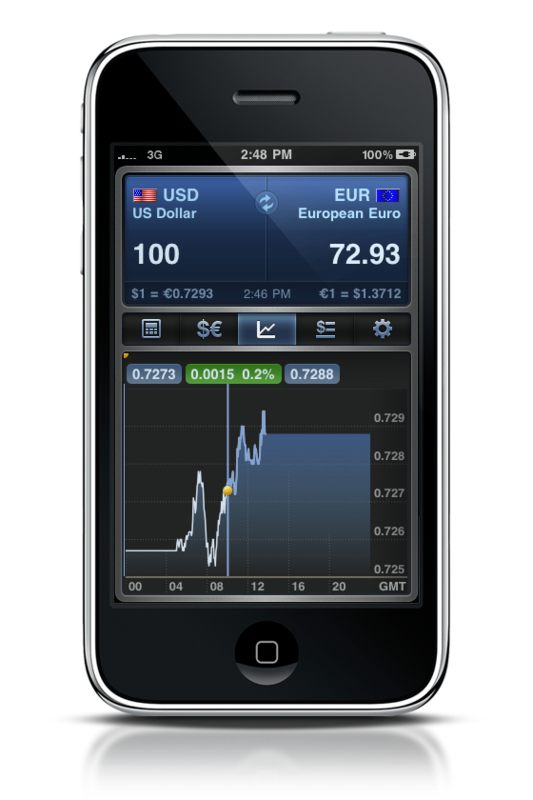 It doesn't matter if exchange rates are a dark subject for you, this app will make it easy to understand even the most in-depth chart. It's available at $0.99 in the App Store [iTunes Link] , and if you still don't have a currency converter app you should go buy it. Same applies if you're tired of Convertbot and you want to try something new.